by Father Daniel Sinisi, T.O.R. Over 800 years ago, a young man named Francis tried to find himself—tried to discover his identity, his place in life, and his calling. He entered a small church, and inside, Christ spoke to his heart and asked him to rebuild his church. This man, now known to us as St. Francis of Assisi, first rebuilt the crumbling building and then, with growing understanding, determined his vocation was helping rebuild the church while witnessing God’s redeeming love for all people. Catholic colleges in the Franciscan tradition seek to help young people find their calling and identity. They also teach students to use and grow in their God-given gifts—all in the spirit of the life of St. Francis. He loved God’s creation and wrote the “Canticle of the Creatures,” considered one of the greatest poems of all time. Because of this, Franciscan colleges promote the study of the arts and letters, in addition to probing the mysteries of the natural, scientific world. 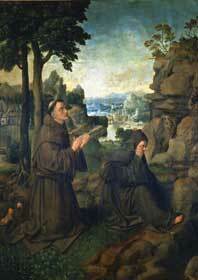 St. Francis also reached out to victims of leprosy, his society’s most marginalized people. As a result, the early Franciscans studied medicine to find a cure for leprosy, calling Franciscan colleges to provide studies in the health sciences. Francis disagreed with the way his merchant father conducted business, so he emphasized that all human relationships, including commercial, show respect for human dignity. Consequently, Franciscan business programs inform students to be ethical leaders. Education outside the classroom is vital to student growth, and colleges influenced by St. Francis of Assisi accentuate student development through extracurricular activities. The people of the world are brothers and sisters to each other; thus, growing in human relationships through activities and student clubs is essential. Francis was also a servant, especially to the most vulnerable, and schools following his teachings work to support a multitude of service activities on campus, in the surrounding communities, and internationally. Franciscan colleges want to help young people excel at finding their path and place in life. A significant part of this is leadership development. Academic and student programs in the community atmosphere of campus help to foster leadership skills, so students can go forth and build up the human family. The world today is not so unlike St. Francis’s—it is experiencing major change and, to some extent, upheaval. Like the young Francis, students need guidance and support to build a moral, spiritual, and intellectual foundation to live healthy and productive lives. Dedicated to God and building a better world through the traditions of St. Francis of Assisi, Franciscan institutions help provide such a foundation.